The 425 proportional I/P converter uses advanced closed loop electronic control to achieve accurate, high resolution pressure control. It is available in explosion proof and intrinsically safe versions and its vibration immunity and weatherproofing make it ideal for field application. 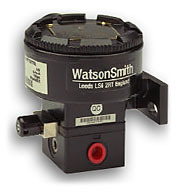 All instruments are tested on the Watson Smith Automatic Testing System and an individual test certificate is provided at no extra charge. Each unit is tested for linearity, hysteresis, total error, settling error, over pressure, air consumption, response time, calibration, insulation, start-up current, supply sensitivity and voltage load. Models in this range include the 53AF2101, 53AF0132, 53AF0121, 53AF2133, 53AF2134, 53AF2123, 53AF0127, 53AF0111, 53AF2111, 53AF2129, 53AF0130, 53AF2128 and the 53AF0115.